The Qingming Festival, or Tomb Sweeping Day, which falls on April 4 this year, is a centuries-old tradition in China meant to mourn the death of ancestors. Qingming, which means clear and bright, happens in early April every year and signals the onset of warmer weather, spring and family outings. 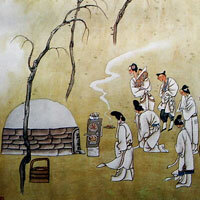 It is said that the Qingming Festival was originally held to commemorate a loyal man living in the Spring and Autumn Period (770 - 476 BC), named Jie Zitui who cut a piece of meat from his own leg in order to save his hungry lord who was forced to go into exile when the crown was in jeopardy. The lord came back to his position nineteen years later, and forgot Jie Zitui but later felt ashamed and decided to reward him. However, Jie hid in a mountain with his mother. In order to find Jie, the lord ordered the mountain set on fire. Jie was later found dead with his mother. In order to commemorate Jie, the lord ordered the day of his death be commemorated as Hanshi (Cold Food) Festival – a day when only cold food could be eaten. The second year, when the lord went to the mountain to pay sacrifice to Jie, he found the willows revived, so he gave instructions that the day after Hanshi Festival was to be Qingming Festival. 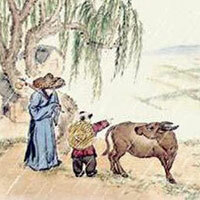 Later, the two festivals became combined as one - Qingming Festival. Tomb Sweeping Day is a time for various activities, the more popular including tomb sweeping, spring outings, and kite flying. 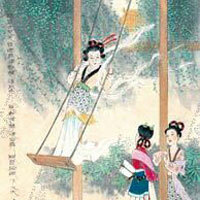 Some other customs, such as putting willow branches on gates and riding on swings, adds infinite joy to the festival. The festival integrates both sadness and happiness. Qingming is the best time for Taqing, or spring outing, and enjoying the early blossoms before summer. During the spring, everything in nature takes on a new look, as trees turn green, flowers blossom, and the sun shines brightly. It is a fine time to go out and appreciate the beauty of nature during the festival. Swings are very popular amongst children. As a popular custom on Tomb Sweeping Day, swinging not only stops the chillness from eating cold food, but is also believed to develop a child’s bravery. Ju is a rubber ball made of leather on the outside and stuffed tightly with feathers on the inside. Cuju means "kick the rubber ball with foot". 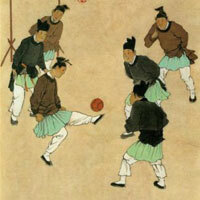 It was a popular sport played by the ancient Chinese during the Qingming Festival. The Yellow Emperor was purportedly the initiator of Cuju, and he invented it to train his soldiers. 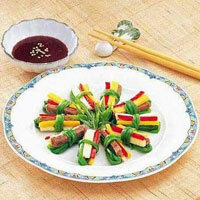 The Hanshi (Cold Food) Festival is usually one day before Qingming Festival. People don’t cook on this day and only cold food is served. As our ancestors often extended the day to Qingming, they were later combined. Tomb sweeping during the Qingming Festival shows respect and offers sacrifice to ancestors at grave sites. According to the custom, when sweeping tombs, people offer food, tea, wine, chopsticks, joss paper accessories, and libations to their ancestors, adding fresh soil to the grave, and sticking willow branches on the tomb. Kowtow is also an indispensable part of the custom. 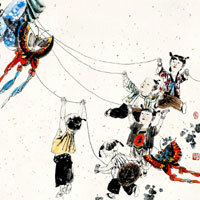 Flying kites is also an important custom enjoyed by many people during the Qingming Festival. It is believed to bring good luck and eliminate disease.